Cisco wants to make Internet of Things deployments easier to scale and manage by expanding its intent-based networking capabilities to edge networks. Vikas Butaney, vice president of product management for IoT at Cisco, told CRN that the new IoT edge capabilities will create new opportunities for channel partners already familiar with Cisco’s intent-based networking tools and resources for traditional IT networks. “We’re giving them the tooling, training and capabilities that helps expand capabilities,” he said. 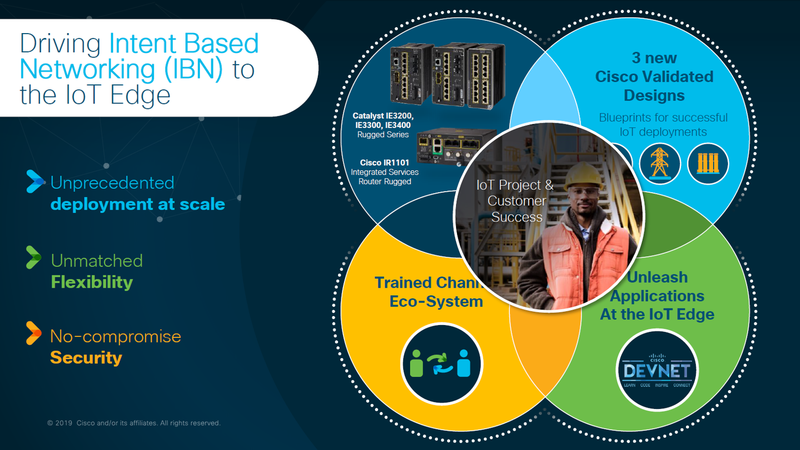 As part of Cisco’s announcement, the company detailed two new lines of IoT networking products, three validated designs to help partners accelerate IoT deployments and new training resources. Butaney said intent-based networking makes it easier to scale and manage IoT networks, which can have as many as tens of thousands of devices in one company, by bringing automating key IT functions. This, he said, gets rid of the new for what partners have traditionally done: manual setups, device-by-device. “With intent-based networking, you can create consistent set of configurations and group those devices in innovative ways,” he said. This ability to create micro- and macro-segmentations of devices creates improved security within the network, preventing certain devices from talking to other systems to reduce security gaps, according to Butaney. The intent-based networking infrastructure also gives partners full visibility and control of every aspect within the network, including performance, security, analytics and operations, he added. Butaney said with the extension of intent-based networking to the edge, Cisco can provide a consistent experience across its entire network architecture, with one set of security policies. That means both products, which run on Cisco’s IOS XE operating system, can be easily upgraded with new technologies, such as 5G, reducing the need to “rip and replace” when new products come to market. The company said this makes IR1101 the “industry’s first 5G-ready industrial router.” Meanwhile, the new Catalyst switches supports options for fiber, copper and Power-over-Ethernet ports. “We are taking our intent-based networking architecture we have been working with channel partners and extending it to the IoT edge,” Butaney said. To help partners expand intent-based networking to IoT, the company is providing three new network designs that have been validated by Cisco and large industrial companies like Rockwell Automation and Siemens. “In these environments, customers are risk-averse, so they need to be shown that this has been done before,” according to Butaney. The designs cover industrial automation for manufacturing plants, utility substations, mining operations and oil and gas environments; distribution automation for utility grid feeder networks and secondary substations; and remote and mobile assets for public safety vehicles, service fleets, outdoor equipment and remote sites. Each design provides the system design and configuration, a bill of materials, common use cases and best practices for security. The company promises that the designs lowers the interoperability risk while providing partners faster and more repeatable deployments. Cisco is making available application development tools and resources for the edge through the company’s IoT Dev Center, an expansion of its DevNet program. Butaney said developers can create new applications and microservices that run on Cisco’s new switches and routers for the edge. The applications, in turn, can be sold through DevNet’s app exchange program. In addition to the exchange, DevNet, which Cisco said has a community of more than 500,000 developers, provides application development tutorials, sandboxes for writing and running code. To get partners on board with Cisco’s new intent-based networking capabilities for IoT, the company is expanding its training resources as part of its IoT Partner Program. The program, which was launched at last year’s Cisco Partner Summit, has so far provided 50 training sessions for sales and technical professionals, with 500 attendees trained and 200 certified to date. Training sessions cover topics such as IoT networking and use cases for enterprises and mobile assets. Butaney said Cisco wants to help train traditional IT partners who have opportunities to expand with existing customers who may find an increasing new for IoT expertise with their warehouses, distribution centers and parking lots, among other non-office environments. “What we’re finding is our customers need a trusted IoT partner base,” Butaney said.